In this paper, we proposed an improved Generalized Cross-Correlation Phase Transform (GCC-PHAT) based on segmentation to estimate a time difference of arrival (TDOA). Traditionally, a GCC-PHAT computes the TDOA between two signals for a given segment in a complete signal. A computation of the TDOA is repeated on every segment between a pair of sensors. A time delay is estimated after a cross-correlation between two segments of signals in the frequency domain. However, in this study instead of the cross-correlation between two signals from segment to segment, this approach is selecting a segment that contains a frequency of interest within the signals. Both selected segments do not need to be aligned for implementation of the cross-correlation. The TDOA estimation is derived based on an intensity of a received signal with the frequency of interest after computing the GCC-PHAT. 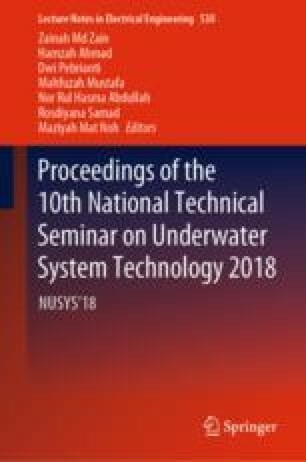 According to an experimental result, a proposed method is successfully validated on a real data containing a base signal that are recorded from a hydrophone. This project is supported by a FRGS Grant: 203/PELECT/6071291. Authors would like to thank Universiti Sains Malaysia for providing a necessary tools and an instrumentation to conduct a research. A permission given especially during the experimental testing is truly appreciated.